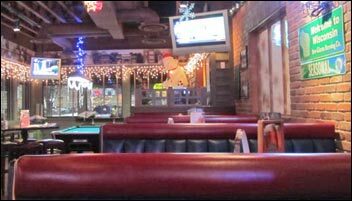 Old Chicago restaurant has a warm and cozy atmosphere with red brick walls, large comfortable booths, tables, and a long beautiful bar. I stopped at the restaurant, which is located in Ashwaubenon on Green Bay’s west side, for dinner. As I walked in the hostess greeted me and told me I had the choice of dining in the bar lounge area to the right or in the dining room to the left. I decided to dine in the bar lounge area. I found a booth, but I was not acknowledged by any staff for at least five minutes. A server then brought a menu and smile to my table. She asked if I would like to order a beverage and after I inquired if they had any specials she informed me that the appetizers were half off. 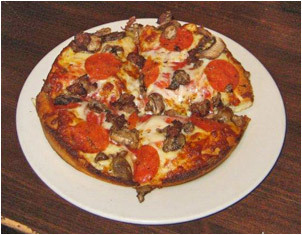 Although Old Chicago restaurant has a variety of items on their menu they specialize in pizzas. I ordered the individual sized classic pizza for $10.49. The description toted loads of pepperoni, Italian sausage, mushrooms, roasted garlic, and mozzarella cheese. As I was waiting for my pizza I noticed they had the room nicely decorated for the upcoming holiday which is Valentine’s Day. Also adorning the walls were sport pictures, bar signage and a large board stating which specialty beers were being featured that evening. There were quite a few different varieties of beer on the board, for the bar carries 110 different beers. The pizza came out nice and hot and smelling delicious. It was thick crust covered with cheese but the main ingredient that was on the pizza was pepperoni and there was only a light scattering of fresh mushrooms and Italian sausage. The crust had a buttery flavor and the cheese was of good quality, as were the other ingredients, but their description of the pizza with LOADS was definitely over exaggerated. Old Chicago offers a nice atmosphere with a huge selection of beverages in the bar and on the menu. Since flying the coop from the Sunshine State and living in the Midwest, I have come to appreciate the wintery months (not really). I fully embrace long underwear and wearing layer upon layer of clothing. I love putting the fire on at night and eating heavy warm foods. I should also mention I love washing down these big meals with heavier and real beers, not my usual Lights. How else am I going to gain what my dear mother refers to as “my winter weight?” So where, oh where, is there a place in Green Bay to get these so-called warm foods and delicious beers? Why, Old Chicago, of course! 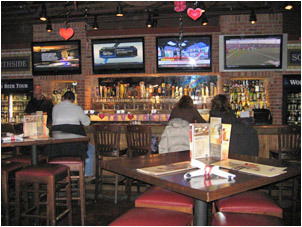 Old Chicago is located in the Ashwaubenon area, to be more specific, on the outskirts of the Bay Park Square Mall. When you walk in, the dining room is on the left and the bar area is on the right. My partner in crime and I raced each other to the bar side. Since it’s that Holiday time of year, Old Chicago has sparkly lights up and presents adoring the exposed brick walls. I love holiday cheer! The bar side is quite a large room. There’s plenty of space for a pool table, a large rectangular bar, more than a few booths and hi-top tables. The logo for Old Chicago states on it that there are 110 brews here. Is this true? Yes. Can I name them all? No way, man. BUT, I can tell you that there are beers from the following countries: England, Ireland, Belgium, Czech Republic, Italy, Mexico, Canada, Germany, Jamaica, Denmark, the Netherlands, Japan, China, Australia and finally the good ‘ol US of A. Out of all the beers from all these countries you have multiple varieties of light beer, dark beer, fruity beer, gluten-free beer, cider beer, ale beer, lager beer, stout beer and you-name-it-beer. Seriously, name it and more likely than not, Old Chicago will have it. The bartender and server were super friendly; they actually helped my friend pick out her beer. 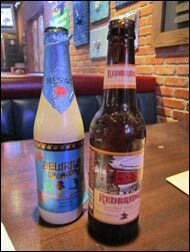 She settled on the Delirium for $6.99 and I ordered a Redbridge for $3.99. The Delirium has twice the amount of alcohol than my choice. Lame. Or not so lame if you were my friend. They also have a fully stock liquor bar if you’re in the mood for stronger poison. On every table is a drink menu, listing all the beers, wine, cocktails and Non-Alcoholic beverage choices. You are bound to find something that will please even the pickiest of people. Oh yeah! I should also tell you that Old Chicago offers beer flights (aka samplers) too. How cool is that? Can’t decide? Get them ALL! Kidding. Old Chicago may be huge on beers, but they also have a full menu offering pizza, pasta and more. Their kitchen stays open till 1AM daily. Happy Hour is Monday – Friday from 4PM to 6PM and then again 10PM to Midnight. You can get a buck off draft pints, well cocktails and house wines. And on Tuesday nights, they have a team trivia game at starting at 7:30PM.